Cormorants are large, long-necked black birds that swim low in the water and are able to dive and move about under water with great agility; this capacity makes them very effective at catching fish, on which they feed. 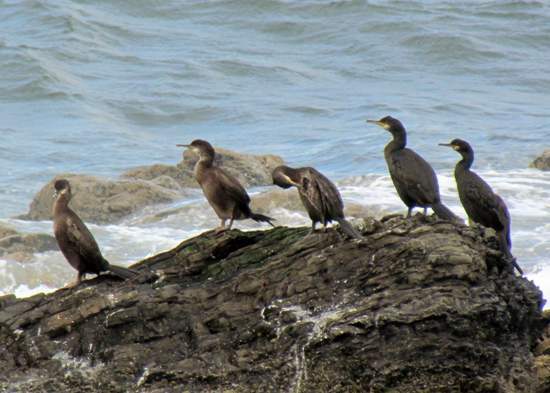 You will see Great Cormorants in the British Isles all the year round. Many spend most of the year, including the breeding season, near the coast but move inland when the rivers are low in summer and food there is easy to catch. 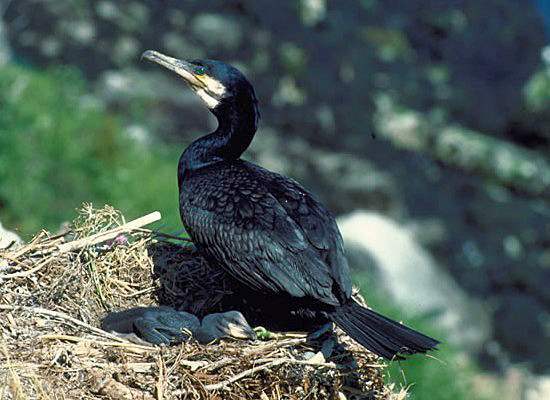 Some Cormorants breed inland; they are considered a serious predator of trout and coarse fish on still-water fisheries and on some rivers. Breeding areas at the coast include islands and cliffs beside shallow seas and estuaries; inland, they roost in trees and their droppings can sometimes kill the trees they roost in. A Cormorant can sometimes be seen waiting at the neck of a pool on a small river; when it sees evidence of migrating sea trout entering the pool to run upstream and spawn in the headwaters, the Cormorant plunges in to the pool, using its powerful wings to swim fast enough to catch even these fast-moving fish.